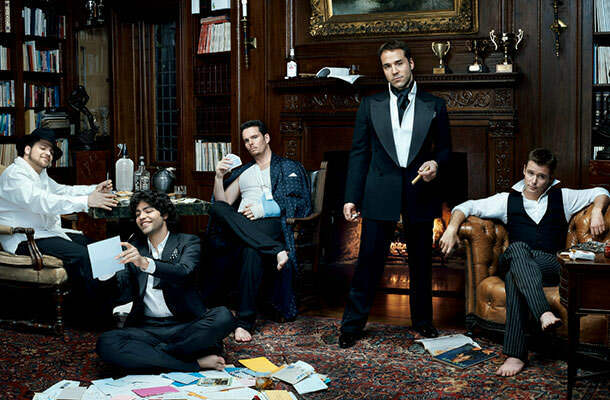 It really must be Christmas because the first look at Entourage, the 2015 feature-length film based on the popular HBO series, has been shared with the world! “Sadly, all good parties must come to an end.” Turns out, they don’t have to! The movie starts with a separate, fictional film starring Adrian Grenier’s Vincent Chase. Suddenly, the “trailer” is paused and we finally see what we were waiting for: the gang in yet another scene of Jeremy Piven’s award-winning portrayal of super-agent with anger-management issues Ari Gold yelling at Chase and his crew. The first trailer for the Entourage film sums up all the things we loved about the show: a look behind the scenes of modern Hollywood, people waging talents, having disputes, the power-brokers who let actors and directors live how they want, and the overwhelming false appeal of the world of show business. Vince, E (Kevin Connolly), Turtle (Jerry Ferrara) and Drama (Kevin Dillon) cruise in fancy cars and on expensive boats, surrounded by beautiful women. The trailer is basically the TV show in a nutshell. The trailer (and thus, the movie) features cameos of Billy Bob Thornton, Haley Joel Osment, MMA fighter Ronda Rousey (who beats Turtle up, logically), and executive producer Mark Wahlberg who probably played a big role in getting the show on the big screen. Come on 2015, get a move on it!